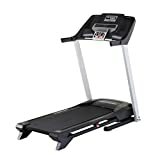 The ProForm 530 ZLT treadmill has a 2.0CHP motor that lets you run at up to 16 kph (10 mph) at an incline up to 10%, both selectable in an instant with the Quick Controls. The good sized running deck features the ProShox- Cushioning to support your joints on every stride. Choose from one of the 16 pre-programmed workouts and see your important workout data on the LCD screen that has a RaceTrack display. Measure heart rate using the EKG pulse grips and plug your iPod® or mp3 player into the music port to listen to your tunes over the Intermix Acoustics 2.0 speakers. The SpaceSaver® folding system with EasyLift assist, combined with the transport wheels, makes the running machine very practical.